Dedicated to OG's miraculous TI8 run and ultimate victory! 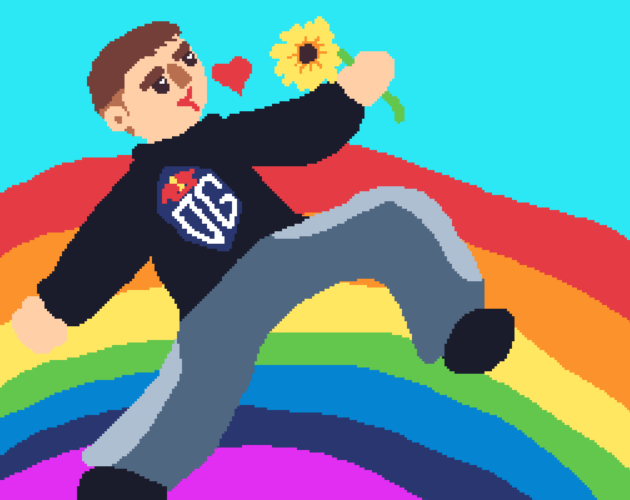 Traverse a rainbow filled level to help n0tail collect flowers in order to win tournaments... but watch out for the players from the other teams! They will do anything to stop you from becoming the Greatest of All Time! Ganked teammates occasionally fall from the sky, and if you pick them up they will help you win! Use the arrow keys to move. You can jump through rainbows to go high, or drop down to get to the lower part of the screen. Collect all of the flowers in a level to complete it. Watch out for enemy players. Pick up your teammates - they will power you up and help you win. Complete a level in under 40 seconds to gain another life. TI8 was a very emotional tournament, I felt sad that Fy-god didn't get the aegis (because he really deserves it), but I was very happy that n0tail finally achieved his dream.